My virtual community has invaded our living room. Has yours? 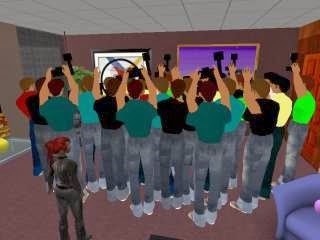 Virtual Ability in Second Life® is a group. Virtual Ability, Inc. is also a nonprofit organization registered in Colorado, USA. Most vitally, though, the people that ARE Virtual Ability are a community, a virtual community that extends around the world, across time zones and cultures and languages. There are many ways to define a community. Most definitions include things like social ties, shared common perspectives, and shared actions or interactions in a shared setting. Sociologists include things like ethnicity and language, caste and social divisions. Historians include settlement history and conflict history. Economists throw in interconnected livelihood strategies, and anthropologists add cultural factors, values, and shared cultural beliefs. Peter Block’s 2008 book “Community: The Structure of Belonging” takes a look at community, and at the creation of communities, from a slightly different angle. My supper table discussion focused on how members of the community at Virtual Ability in Second Life® discover/figure out/create/ learn ways to “belong” and feel connected to people physically residing all over the world. Block names shared experiences, shared contexts, and the back-and-forth of listening/ paying attention to each other as the critical aspects of a community that offers the power to transform us from isolated to together, from disconnected to connected. When Virtual Ability started, the founders recognized how easily disability can get in the way of connecting. So, one part of Virtual Ability’s mission is to provide people with disabilities with a supportive environment so they can enter and thrive in virtual worlds. Accessibility, universal design, and assistive technology are part Virtual Ability, but the sense of belonging seems the most significant reality. Connecting? Belonging? Listening? Sharing? Inclusivity? Freedom? Equality? Those are some of the things that I talk about when I describe my friendships and my experiences in-world. How would you describe the sense of community that certainly seems to make Virtual Ability unique?